The guest list for Nancy Reagan's funeral tells a story about the remarkable life she shared with husband Ronald Reagan -- decades that stretched from Hollywood's Golden Age to the California governor's office to the White House. 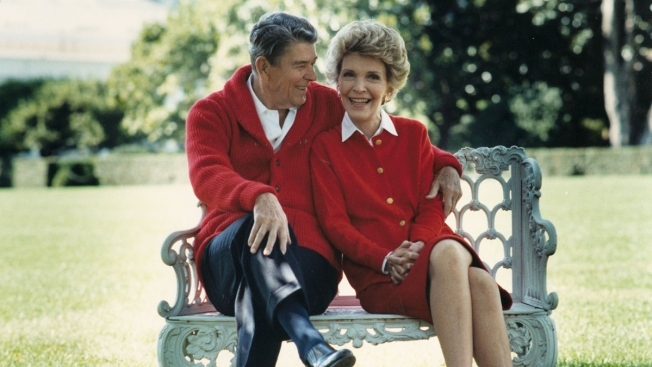 Along the way, the Reagans developed relationships with celebrities and powerful political figures who will be represented at Friday's funeral on a hillside northwest of Los Angeles. Four of the five living first ladies and relatives of every president dating to John Kennedy were expected to attend. It brought together Democrat and Republican, an unusual tableau at a time of deep division in Washington and the 2016 campaign trail. Hillary Clinton took a break from the presidential campaign to attend, and other politicians on the list cover the political spectrum, from Newt Gingrich to Nancy Pelosi. Nancy Reagan's two children, Patti Davis and Ronald Prescott Reagan, were among the speakers at the funeral, which include a Southern California high school choir and a Marine Corps band. James A. Baker, who served in the Reagan administration, and former NBC News anchor Tom Brokaw also gave remarks during the private ceremony officiated by the Rev. Stuart Kenworthy, vicar of Washington National Cathedral. The 1980s TV icon worked with Reagan and her "Just Say No" anti-drug campaign. He arrived at the Reagan Library service wearing a U.S.-flag themed bandana on his head and military fatigues, then took a seat next to actor Gary Sinise. They were just two of the guests with star power, including singer Wayne Newton, Beach Boys co-founder Mike Love, actors Tom Selleck and John Stamos, Soviet-born comedian Yakov Smirnoff and Bo Derek. Tina Sinatra, the youngest child of Reagan friend Frank Sinatra, also is on the guest list. Most details of the funeral were planned by the former first lady, including flowers, the guest list, music and, most importantly, her burial spot just inches from her husband. But one addition was planned after her death -- 71-year-old Camarillo bagpiper Bill Boetticher played "Amazing Grace." Boetticher played at Ronald Reagan's funeral, and family members decided his presence would be fitting. Below, a list of notable guests provided by the Reagan Library.